HOLTWOOD, Pa. — As the sun sets over Cover Crop Solutions’ sprawling fields, a small group huddles around Ray “The Soils Guy” Archuleta. The cluster, which includes two Amish men, a fledgling Pennsylvania grape grower and a farmer-turned-feed salesman, are captivated by Archuleta, an animated soil scientist with the Agriculture Department’s Natural Resources Conservation Service. He rubs the dirt in his fingers and takes in deep inhalations from a handful of soil. 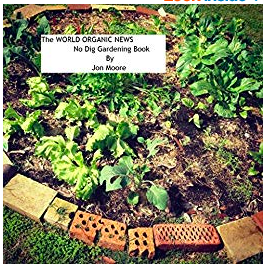 He answers questions on manure, planting seasons, even healthy food choices. It’s not easy, he says. There’s a balance of tilling, pest control, watering and cover crop planting that can make or break a harvest. “Expect to fail,” Archuleta tells the huddle. But when that balance works, it can bring greater yields, cleaner water and lower costs over time. Archuleta’s small audience, along with nearly 300 others, have come to Cover Crop Solutions field day, a showcase of the seed company’s products, as well as a place for farmers to talk shop. The company is one of a handful that deal exclusively in seeds for cover crops — plants that make the ground more fertile, reduce the risk of harmful algae blooms and help control soil from running into waterways during heavy rainstorms. 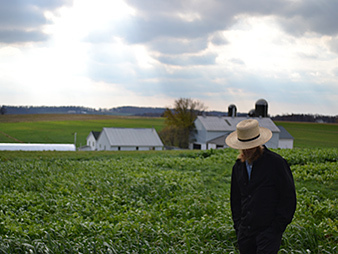 An Amish farmer looks at cover crops on a farm in Lancaster County, Pa. Photo by Tiffany Stecker. For years, conservationists have encouraged growers to plant “green manure,” as it was once called. It’s no cash crop, but the benefits will far outweigh the costs, they say. The number of cover crop acres has nearly doubled since 2009, according to NRCS figures. In Maryland, where the Chesapeake Bay’s poor water quality has driven generous state-led cover crop incentives, the state Department of Agriculture announced a record number of acres enrolled in the 2014-15 crop year. Recent studies find they can boost production, too. A 2,000-grower survey released in November found corn and soybean yields in fields that had been planted with cover crops experienced significant yield increases (Greenwire, Nov. 18). Still, cover crops can be a hard sell. Keep them in too long and they might crimp a cash crop’s growing season, say some farmers. If they infuse too much nitrogen into the soil, they could make leguminous plants like soybeans “lazy” and less productive, say others. Another concern is that the seeding of corn within the cover could invite unwanted insects.